You are viewing » Home » Issues » Bays & Foreshores » Is There a Bays Precinct Strategy Anymore? Sadly, the answer to the above is no. The sudden death of UrbanGrowth as a strategic player following its brave (and apparently justified) refusal to accept any of the developer proposals for the White Bay power station site has returned the Bays Precinct to uncoordinated development lacking visible strategic coherence. 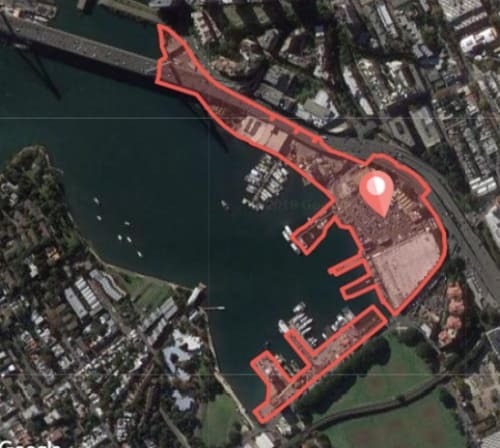 The left-over bit of UrbanGrowth-as-developer only retains responsibility for the Blackwattle Bay development – so there is, once again, no one agency with strategic oversight of the development of this extraordinary area of publicly owned harbour foreshore. The Government’s failure over recent years to deliver (or permit?) a coherent and integrated transport plan for the Bays Precinct and surrounding areas has pretty much strangled the original concept. Note this was central to Google’s public reason for pulling out of its original bid to locate its main offices in White Bay. However, I would guess this is more a matter of UrbanGrowth being told rather than participating in decision making. UrbanGrowth has indicated they ‘are in the process of engaging an independent consultant to carry out an evaluation of the Reference Group … I hope they don’t spend much money on this – the Group could give them a succinct evaluation for free. The demise of the community reference group? The Bays Precinct CRG has run its designated two-year term. I – like others – did not attend the last meeting. It was never able to function as a meaningful consultation process because there was such a tight restraint (almost certainly from the Government) on UrbanGrowth sharing ANY useful information with the Group. UrbanGrowth has indicated they ‘are in the process of engaging an independent consultant to carry out an evaluation of the Reference Group, including the Terms of Reference’. I hope they don’t spend much money on this – the Group could give them a succinct evaluation for free. In the meantime it has been suggested the CRG will continue to meet under the old terms of reference. The City of Sydney Council has initiated regular meetings with Bays community representatives, local MPs (Jamie Parker and Alex Greenwich) and the Inner West Council to consolidate our information on the Government’s intentions in relation to the Bays Precinct and surrounding areas and to explore ways we can influence its decisions. The most recent one was held on 1 March – Asa Wahlquist and I attended for the Glebe Society. The main discussion was on the magnitude of and flow-on impact on traffic and general amenity of major development and construction activities in this part of the inner west over the next few years. These include: the move of Hansons’ cement mixing plan to Glebe Island; the construction of the new Fishmarket and the highrise redevelopment of the current Fishmarkets site both supposedly commencing in 2018; the construction of the new City metro and its tunnels and stations including one in the Bays Precinct; the WestConnex construction work around the Rozelle interchange and a proposed dive site on Victoria Rd for one of the harbour tunnels. Glebe Island will become the service/supply centre for nearby construction activities. I also understand that it is planned to service all supplies and waste removal from excavation work on the new Fishmarket site by boat. 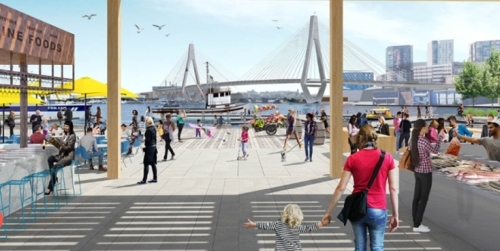 We have difficulties envisaging what these plans mean for Blackwattle and White Bay. The lack of visible transport planning to cope with the massive increase in traffic that can be expected from the WestConnex and the Fishmarket developments was also a key issue. The lack of meaningful (or any) consultation or information from the Government or its agencies was of course the ever-present issue. A number of proposals to address this were considered and a meeting with the Premier is being requested. I previously reported on a meeting we had last year with the Danish architect 3XN contracted to design the Fishmarket building at its new site at the head of Blackwattle Bay (the current Hansons’ cement mixing site). UrbanGrowth and the architects subsequently held similar public briefings. I reported some optimism that these respected architects may come up with a terrific design for the new Fishmarket building. This optimism was counterbalanced by the multitude of constraints and problems surrounding the venture: the limited space of the site and the technical challenges of building largely on and under water; the total lack of information about traffic management on Bridge Rd or parking provisions given the projected 6 million visitors pa; the relationship with, and implications for, Wentworth Park and – most importantly – the typical lack of any public information demonstrating the relative public and private benefit of the decision to relocate the Fishmarket to this small and difficult site to allow the sell-off (we presume) and private development of the current publicly owned Fishmarkets site. Since then we have had no official information about progress. However the release of the design is due and we have been expecting it for some time. The Government schedule is for construction to commence before the end of 2018. There are rumours that the architects have found the proposed site is too small and so have made a bid to extend the footprint for the structure further out into Blackwattle Bay. Now isn’t that a surprise! The big action relates to the redevelopment of the old Fishmarkets site and adjoining Bank St sites. As reported previously, an urban designer (FJMT) was appointed in August to design a master plan for what has been dubbed the ‘Bays Market District’. This is also due but has not yet surfaced. It is being developed (as far as we know) with the same lack of related traffic management or transport and social infrastructure planning information. As high rise residential and commercial development is planned for most of the site, this appears to be an incoherent and reckless approach to urban planning. No decision has yet been made in relation to the highly controversial proposal to relocate Joe Elias’s All Occasion Cruises operation from its current site next to the Fishmarkets (B1 B2 wharves) to Bank St for 10 years to allow the construction of the new Fishmarket. It is, however, my understanding that the relocation has been approved – and the Government will announce it soon. This approval will be granted notwithstanding the, seemingly inconsequential, fact that 210 out of the 220 submissions in response to the proposal strongly objected to it on a host of grounds. The objecting submissions included those from the Glebe Society and the City of Sydney. There are serious concerns the proposal will have significant and ongoing impacts and that it is in direct conflict with the wider needs of the Bays Precinct transformation and the State Government’s long-standing commitment to prioritise the site for community uses. There are also concerns the Government will approve the application, despite overwhelming public concern, given the marina’s existing lease arrangements. …will you urgently instruct Urban Growth to withdraw its application before the Government approves it. We can but await the decision.